What to do when the character is close to the destination. The character will stop as quickly as possible when within endReachedDistance (field that exist on most movement scripts) units from the destination. The character will continue to the exact position of the destination. In 2D this is a circle instead. This will behave identically to the Sphere mode in 2D. In 2D this is a single point instead. How to visualize the graphs in the editor. Draw the graphs with a single solid color. Use the G score of the last calculated paths to color the graph. The G score is the cost from the start node to the given node. Use the H score (heuristic) of the last calculated paths to color the graph. The H score is the estimated cost from the current node to the target. Use the F score of the last calculated paths to color the graph. The F score is the G score + the H score, or in other words the estimated cost total cost of the path. Use the penalty of each node to color the graph. This does not show penalties added by tags. Visualize the connected components of the graph. A node with a given color can reach any other node with the same color. Use the tag of each node to color the graph. Visualize the hierarchical graph structure of the graph. This is mostly for internal use. Call UpdateArea in the unity thread. This is the default value. Not compatible with SeparateThread. Call UpdateArea in a separate thread. Calls UpdateAreaInit in the Unity thread before everything else. Calls UpdateAreaPost in the Unity thread after everything else. This is used together with SeparateThread to apply the result of the multithreaded calculations to the graph without modifying it at the same time as some other script might be using it (e.g calling GetNearest). Combination of SeparateThread and UnityInit. How to estimate the cost of moving to the destination during pathfinding. Manhattan distance, but allowing diagonal movement as well. This option is currently hard coded for the XZ plane. 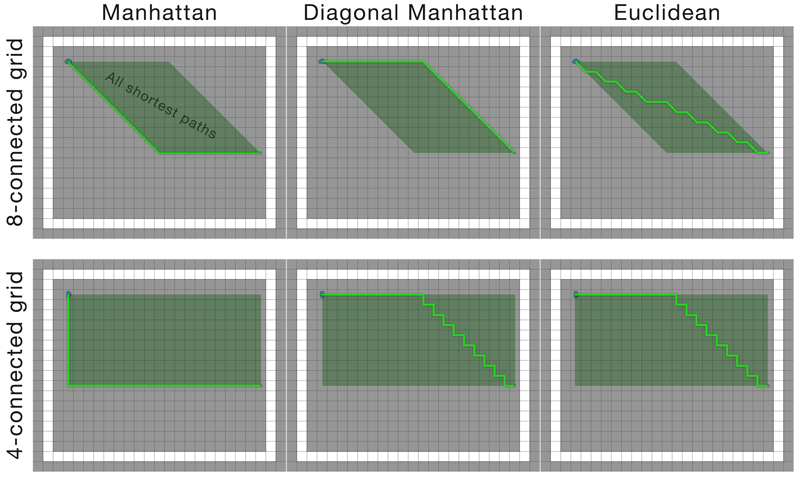 It will be equivalent to Manhattan distance if you try to use it in the XY plane (i.e for a 2D game). Use no heuristic at all. This reduces the pathfinding algorithm to Dijkstra's algorithm. This is usually significantly slower compared to using a heuristic, which is why the A* algorithm is usually preferred over Dijkstra's algorithm. You may have to use this if you have a very non-standard graph. For example a world with a wraparound playfield (think Civilization or Asteroids) and you have custom links with a zero cost from one end of the map to the other end. Usually the A* algorithm wouldn't find the wraparound links because it wouldn't think to look in that direction. The heuristic is the estimated cost from the current node to the target. The different heuristics have roughly the same performance except not using any heuristic at all (#None) which is usually significantly slower. Value is the distance between two opposing sides in the hexagon. Value is the distance between two opposing vertices in the hexagon. Value is the raw node size of the grid. Number of neighbours for a single grid node. State of a path request. The path has not been calculated yet. The path calculation is done, but it failed. The path has been successfully calculated. The path has been calculated, but only a partial path could be found. How path results are logged by the system. This is recommended for release since logging path results has a performance overhead. Logs basic info about the paths. Same as heavy, but displays the info in-game using GUI. Same as normal, but logs only paths which returned an error. Internal state of a path in the pipeline. Determines collision check ray direction. Casts the ray from the bottom upwards. Casts the ray from the top downwards. Casts two rays in both directions. Indicates the side of a line that a point lies on. The point lies exactly on the line. The point lies on the left side of the line. The point lies on the right side of the line.